Razer has made a name for itself when it comes to gaming hardware, since they’re a company that specializes in that particular niche market, and we are stoked to say that they have not failed in that aspect. Of course, I still remember the original Razer Boomslang mouse that came out all those years ago, where it boasted a rather unorthodox form factor that made it quite hard to get used to at first, since the trackball was located not right smack in the center of the mouse’s bottom, but somewhat near where your wrist is. Still, the design was revolutionary back in its day, and the company hasn’t looked back since. 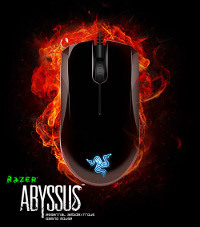 Fast forward to today and you have the Razer Abyssus Mirror Special Edition gaming mouse which will merge a sleek and simple design with a high performance 3.5G 3500 dpi infrared sensor to bring you one mean killing machine – on your computer, that is. This is actually a special edition that sports a black chrome mirror finish without losing any of the key features that is available on the original Razer Abyssus. Why the Razer Abyssus Mirror Special Edition, you ask? Well, it was built with gamers who demand the utmost in form and functionality, while offering indefatigable reliability even under the most intense gameplay conditions. You won’t find the Razer Abyssus Mirror slip out from your hand easily even with a glossy finish, although it will definitely be a firm fingerprint magnet. It comes with a couple of large buttons that have been tuned for maximum tactile feedback, while equipped with Razer’s signature Hyperesponse technology. Underneath, Razer decided to include two easily accessible mechanical switches, where one of them is used for on-the-fly dpi switching that lets you choose between 450, 1800, or 3500dpi, while the other adjusts the polling rate, providing instant adjustment from a standard 125hz to 1000hz Ultrapolling. It is now readily available Stateside as well as folks living in Europe, retailing for $49.99 and €39.99, respectively.